KISS MEETS THE PHANTOM OF THE PARK is such an abysmal TV movie that KISS themselves forbad anyone in their presence to mention it. 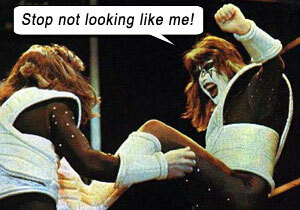 (I think only (Music From) The Elder would eventually become more verboten in the KISS sanctum.) Subpar on every level, it’s like watching a GAMERA movie. Abner Devereaux (Anthony Zerbe, the Alan Rickman of his day) is KISS’s nemesis, fired as the technological genius of the amusement park, his animatronic creations falling out of favor with audiences and the park owner, replaced by rock and roll in the form of KISS. So Abner vows vengeance on KISS and KISS-manity, by capturing the real KISS and sending his KISS androids out to perform in their stead, with dumb replacement lyrics to spur the audience to “rip and destroy” the park. Firstly, this is a Hanna-Barbera production. Which explains so much… And the same braindumb production ethos wrought on Saturday morning cartoons permeates KISS MEETS THE PHANTOM, so that the movie cannot raise its head above Scooby Doo even if it tried. After their starring appearance in Marvel Comics Super Special #1: Kiss (1977), manager Bill Aucoin saw the opportunity to continue promoting KISS as superheroes through this movie. Aucoin figured the band had reached saturation with their albums, tours and merchandise, the movie meant to boost their profile by introducing yet another forum for marketing. Aucoin pitched the movie to KISS as “A HARD DAY’S NIGHT meets STAR WARS,” which explains why the intelligent, far-seeing, career-minded duo of Simmons and Stanley gladly embraced the project initially. Many fans and critics summarily blame KISS (or, more correctly, Simmons and Stanley) for this travesty, but they held no reins, playing only their miniscule acting parts, in a production company that didn’t care on any level. KISS were not given a script but were fed their lines before they were ready to do a take. This project was the last straw for Peter and Ace, who expressed their dissatisfaction with being in the band and were about to quit. To stave off the band’s dissolution, manager Aucoin and Casablanca Records owner Neil Bogart floated the idea to do the Solo Albums, where each member of KISS would create a solo album, all four to be released simultaneously. The soundtrack was originally generic wocka-chicka TV car-chase bumper filler, which lent it even more cheapness. Interestingly, the European edit of the film replaced the soundtrack with source music from all four KISS Solo Albums (yet the Solo Albums had not yet been recorded at the time of the original American version’s release as an NBC Movie of the Week). The Solo Album cuts actually raise the level of the overall film (at least to the level of The Flintstones). Ace’s stuntman is clearly African-American. 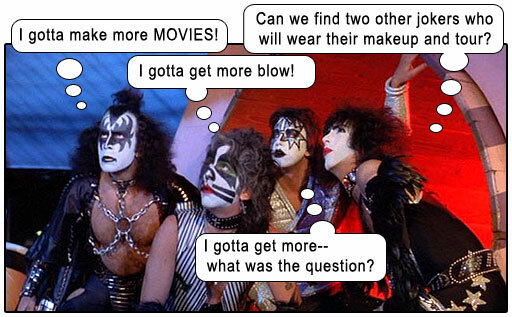 Even with the convenience of makeup and costuming, none of the band’s stuntmen look anything like them, and the execrable directing and editing make it quite obvious there are four other doofuses on set who are not KISS. Even so, it’s reported that Gene does many of his own stunts, so his stuntman is noticeably less prominent. In some versions, many of Ace’s lines are cut, and because he left early during some shooting days, the production used his black double in whiteface. We can tell. Peter didn’t bother returning for voice looping, so cartoon-voicer Michael Bell dubbed all the Catman’s lines in that doofy Brooklyn accent. Must admit, it does sound as doofy as Peter. When Fake Kiss perform, it is with the rewritten lyrics to Hotter Than Hell, called Rip and Destroy. I feel so dirty. What’s interesting is that Fake Paul frowns while he’s singing these destructive words, which we realize he never does in real life; as opposed to Gene, who does frown in real life while singing, so his facial expressions are the same as Fake Gene. Despite its current perceived ranking somewhere between DUDE, WHERE’S MY CAR? and GODZILLA VS. MOTHRA, in 1978, KISS MEETS THE PHANTOM OF THE PARK was one of the highest rated programs of the year for NBC. Yes, it stinks in hindsight, but examine the context in which KISS MEETS THE PHANTOM OF THE PARK was released: As some older fans will note, it was a different time and space – no YouTube, no facebook, no Flixter, no “social media” of any kind; if you owned your favorite band’s albums and a few posters, that didn’t necessarily mean you had seen them live onstage, that didn’t even mean you had heard them speak in their usual voices or seen them move as living figures. When KISS MEETS THE PHANTOM OF THE PARK premiered on American TV in March 1978, it wasn’t a case of TiVo-ing it, or waiting for the encore presentation directly after its premiere on cable; if you missed it, you missed KISS. You missed THE event of the era, on the only “social media” existent – television. Keep in mind, this movie premiered after the fourth KISS album Alive! 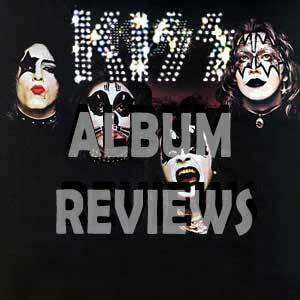 had broken quadruple platinum, and KISS had churned out three more platinum albums after it. Though the band was secretly internally disintegrating, their fan base was at its mightiest. Nothing mattered except that you were seeing KISS. You were seeing KISS! aka: KISS IN ATTACK OF THE PHANTOMS. aka: ATTACK OF THE PHANTOM. Writers: Jan Michael Sherman, Don Buday. Starring: Peter Criss, Ace Frehley, Gene Simmons, Paul Stanley, Anthony Zerbe, Carmine Caridi, Deborah Ryan, John Dennis Johnston, John Lisbon Wood, Lisa Jane Persky, Terry Lester, Don Steele, Brion James. Version: European edit with “Solo Albums” soundtrack. This credit sequence is specifically to remind audiences who/what they came to see, for KISS would not appear until the second act, although their presence is continually felt throughout the first. It’s a powerful sequence purely for the presence of KISS and their anthem; it’s KISS just being themselves, not trying to “act.” Teetering on the edge of so-bad-it’s-good.